Testmoz is a free testing tool, which allows for quick and easy use of digital test in teaching. The tool allows you to create several different types of questions, and to create reports from the tests in .csv format. One may choose whether students are allowed to know, whether their answers were right or wrong, and one may choose whether the students are told, what was the correct answers to the questions. Testmoz is primarily suitable for use in the monologic form of teaching, . Within the monologic form of teaching, , Testmoz can be used to ensure, that students have acquired sufficient knowledge about a specific topic. After students have completed a course, the teacher can evaluate their learning outcomes with the help of Testmoz, and on the basis of the evaluation she can provide extra help for those of the students, that require it. The teacher can also target her guidance of the students on the basis of the test results, and she can use the test results to adapt the course for use with a similar target audience. Testmoz can also be used as a regular training tool, where students train trivia on a certain topic, or where they train for instance grammatical rules. When used for this, one might let the students develop small tests for each other. Testmoz is free to use, and it does not require that you create a user account. If you do not create it as a user you have to even keep track of the links to the test you've created – they are not assembled on the side. Create it as a user ($ 20 for a year) you get access to a list of links to the test we have developed. 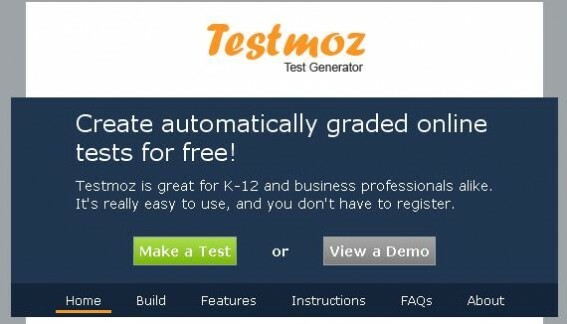 If you want to try to answer a test in Testmoz you can click on the link here: https://testmoz.com/86720. If you want to create your own test, please feel free to click here.